Providing non-traditional boarding since 2001! Boarding guests get to play with Daycare dogs for exercise, socialization and entertainment throughout the day. All dogs have full access to the indoor and outdoor areas to run off any excess energy and be ready for some nighttime rest. City Pet Club maintains a separate area for the older and smaller dogs who might not want to participate in game of chase. (We will soon be adding a Senior Dog area! Please stay tuned.) The Small/Senior dog area offers open-space for roaming, without the frenzied play. It's also equipped with full-size Murphy-beds for snoozing during the day. Additionally, we recognize that older dogs need special attention and we can accommodate senior napping schedules by request. After playing all day, your dog will sleep soundly in our warm and spacious sleeping quarters. 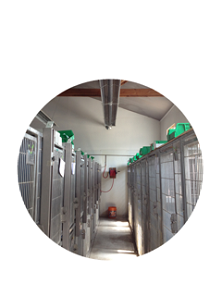 Boarding guests enjoy private sleeping quarters constructed with solid stainless steel partition walls that provide privacy and keep noses and paws safe. Sleeping quarters have radiant in-floor heating to keep guests cozy during winter nights, and they're spacious enough to allow pets from the same family group to share a room, if desired. All boarding guests must complete an Interview in advance of their stay. Please call to schedule and access our Client Portal here. *Family groups receive 10% off for each guest!